Looking to start the new year with a Bullet Journal but are a bit confused as to where to start or what to include? Have no fear, I have been there, done that, so to save you from that stress, I thought I would share 5 tips to start your Bullet Journal. Are you stationargoogy like Me? 1. You can use any notebook of your choice. Yes, there is a specific Bullet Journal you can purchase online. However, I know many of you will be wanting to watch the pennies at the moment and if you are a stationargoogy fiend like me, chances are you will have a notebook lying around which believe me will work just as well as the official bullet journal. I used the Moleskine black notebook and this worked incredibly well. Bullet Journals can be what you make them. So do not be afraid to cater them to suit your own lifestyle. 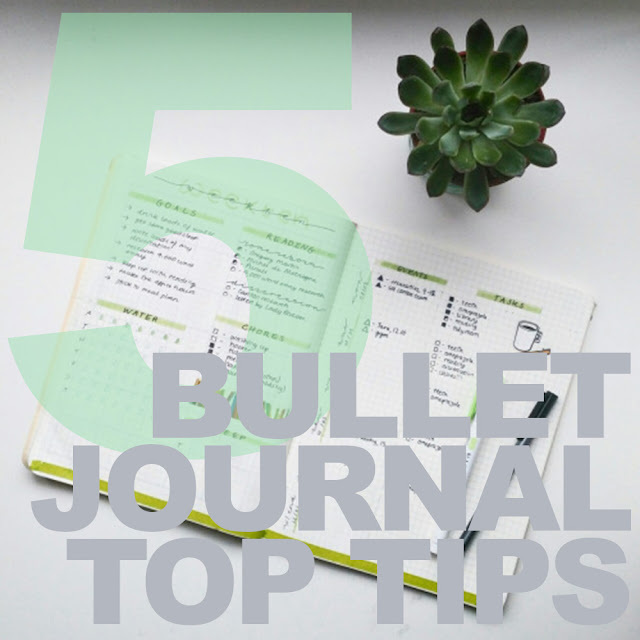 For example your Bullet Journal will include additional pages if you are parent such as children's appointments or if you are a student you may focus your bullet journal to include a budget page to help you keep things on track. As a blogger and vlogger, I also included specific pages to help me stay organised and plan content. When you first start your Bullet Journal, take some time to sit back with a cup and tea and carve out some time to plan out your Journal. See what pieces you need to include and what you feel you can skip. It is also worth noting it proves useful to carve some time once a week (I do this on a Sunday) with the journal to plan the week ahead. It usually takes an hour but it means the rest of the week runs smoothly. 4. Carry it around with you. You never know when inspiration will strike which is why I carry my Bullet Journal around with me. This just means when I find an idea for things such as a blogpost, I can note them down. I also use my break at work to sometimes plan my bullet journal for the rest of the week if I need too. 5. It does not have to look like a Martha Stewart Production. If you search Bullet Journal online, you will see some lovely pictures of beautifully designed pages which although lovely, can put people off from using the Bullet Journal system. As someone who loves being creative but not the best at art I decided to liven things up using different fonts and colours as appose to stickers and drawings. It saves me time and allows me to focus on being organised without the stress of having to make my Bullet Journals Instagram worthy. Are you planning to make your own bullet journal this year?